Spinal pain research demonstrates the importance of the deep sensori-motor system in healthy postural and movement control of the trunk. When this deep muscle system is lazy and weak, the body compensates by over-engaging some of the large more superficial trunk muscles for the job – and that is where problems start to occur for the spine and pelvis. This substandard control leads to ‘injuries’, pains, tightness and stiffness etc. Unfortunately a number of strength, fitness, and ‘core stabilisation’ training programmes don’t pay enough attention to deep system control in the trunk – instead, the tendency is to overly work the large global muscles, contributing to the development of many pains and ‘injuries’ – and the need to ‘use the roller’ and stretch all the time. Key Moves® is a motor relearning programme that teaches clients to move from their deep muscular system – including the ‘core’. This method aims to retrain and recondition the ‘deep’ postural muscle system and help re-establish important ‘key’ basic patterns of movement control in the spine, pelvis and shoulder girdle, necessary for a healthy, fit, strong and robust musculo-skeletal system. As these ‘fundamental patterns of control’ become better established, they are further integrated into more challenging exercises and functional movement patterns. The programme also addresses the health and fitness of the fascial system, to further improve whole body flexibility and movement ease. 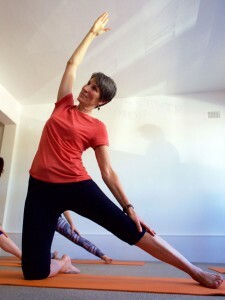 The programme is designed to establish awareness of how to move and where to move from. Clients learn how to change movement patterns and develop a better awareness of how their body is meant to move. In many respects this is as much a practice in neuro-plasticity as it is in muscular fitness. The Key Moves® programme teaches simple but effective ways to overcome bad posture and breathing habits, healthy ways of stretching and strengthening, and the correct way to position the body in daily activities such as sitting, bending and lifting. More recently classes including Key Moves® 4 yoga/pilates/balance and tai chi have been integrated into the programme due to a recognised need for more targeted exercises for people interested in transitioning into more standard community based classes in the future. Due to the popularity of the classes at Edgecliff Physiotherapy Sports and Spinal Centre and interest in the practical aspects of the Key Approach during the Key Approach workshops I have decided to offer 2 short one day courses on the Key Moves®. This pair of practical hands on workshops are suitable for movement therapists who would like to improve their understanding of the Fundamental Patterns of Control which underlie healthy spinal function – and how these are deficient in people with common musculoskeletal pain disorders. They will cover how to identify changes in movement patterns that cause or are related to spinal pain, and provide you with a series of exercises you can use to improve your clients function. I look forward to your involvement. Receive our e-newsletter as well as special members-only access to publications & videos. No spam, promise. Announcing our new forum for workshop participants. Get support from Jo Key after workshops.